With FIRE now on the doorstep it’s time to finalise what my early retirement drawdown strategy and portfolio is going to look like. Firstly, let’s look at the strategy and portfolio that has put me where I am today. I first published it in detail in 2009 and then polished it slightly in 2012. In brief it was about building significant wealth (at least for me) in quick time. 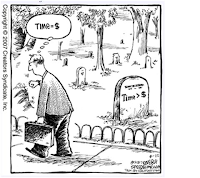 Quick time was less than 10 years which meant I needed to be accruing wealth in relation to My Number at just a little less than 1% per month. A very aggressive target when I look at it that way in hindsight but one which provided Mr Market behaves for just a few more months looks real. By living frugally while focusing on earning more I believed I could Save Hard. To date my Savings Rate has averaged around 52% of Gross Earnings so that has played out. This then advantaged me when it came to investing as I didn’t have to take great investment risk giving me an increased probability of success. I called it Investing Wisely. As it turns out since starting my annualised investment return has been 5.9% which is 3.3% after inflation. When I came out I stated that at the point of Early Retirement I wanted wealth of £1 million (it was actually £1,011,000). Today my trusty Excel spreadsheet is telling me that once I hit £1,023,000 I’m good to retire. At this point it’s then no longer about building wealth but instead the simple problem of ensuring I outlive my wealth which will be drawn on as I’ll have no other earnings. I suspect it may require a slightly different strategy and investment portfolio to that which I have today. That said the principles of tax efficiency, low expenses and a diversified investment portfolio, with a key decision of what Bond to Equity Allocation Percentage at its core, I intend to keep. My current estimates, based on my forecast FIRE date, suggest I’ll actually overshoot my FIRE wealth Number with circa £1,117,000. A Mediterranean life will then mean a life priced in Euro’s. The average exchange rate with the £ since the Euro’s inception has been 1.3742. I’m not going to bank on that. Instead, I’m going to use the worst average year since inception, which was 2009, with its rate of 1.123. That gives me EUR1,254,000 of wealth to buy a home with and live from for the rest of my life. I’m going to assume a 40 year retirement period. Some behind the scenes work leads me to believe that our (initial) dream Mediterranean home in FIRE will cost EUR350,000 plus stamp duty. So all of a sudden my wealth is down to EUR889,000. This is the amount that will stay invested and from which I will drawdown as I do not intend to buy any type of annuity. From a spending perspective I’ll then need my wealth to sweat EUR24,708 per annum which includes all family basic running costs, fun money for me (my better half will self fund her fun money), some holiday money, money for home repairs and money for a car replacement every 10 years or so. That’s a drawdown rate of 2.8% which is greater than the 2.5% I have been planning. Assuming 0.27% investment expenses it still looks ok against Pfau’s analysis which was for a 30 year retirement (as mentioned above I’m planning on 40 years) and which looked at a portfolio which was either 50% Domestic Equities to 50% Domestic Bonds or 50% Global Equities to 50% Global Bonds. Assuming the average Euro to £ exchange rate since inception it would be 2.1%. I could just leave my Equities to Bond Allocation there or I could even use one of a number of rules of thumb. This is important for me so I won’t. Instead let’s continue with some more analysis. I’ve used the excellent cFIREsim for analysis previously and I’m going to use it again. It’s important to note that it uses historic US based datasets for its analysis which according to the Pfau research above makes it more bullish for a UK based investor. Another note is that at this point I’m still going to treat myself as a UK based investor but will try to ensure Mediterranean success with what I hope is a conservative £ to EUR exchange rate. This gives me a get out of jail card if the Mediterranean dream turns into a nightmare. If it doesn’t then in a few years it shouldn’t be too daunting to reallocate to that home base gradually. That’s telling me that historically (and remember it’s US based) I would have been best off with an 80% Equities to 20% Bonds portfolio. Now let’s also bring the knowledge that 30% Equities would have been good enough, the Pfau UK research which used 50% Equities and the rules of thumb back in. Like when I was trying to build my wealth I appear to again just not need to be that aggressive and so why take the risk of a different sequence of returns putting me into trouble. 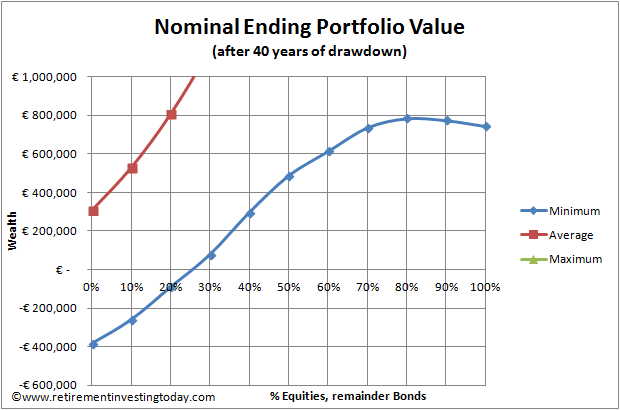 It’s of course not an exact science but weighing it all up I’m going to start with 65% “Equities” and 35% “Bonds”. Now I need to add my portfolio diversifiers. Here I’ll use the rules and percentages I’ve consistently used up until now and written about ad infinitum. As I do today my Bonds will be a mixture of UK Index Linked Gilts and Global but predominantly UK Corporate Bonds. On a topic like this it would be great to get readers thoughts here which includes your strategy as the sum of our collective knowledge is far more powerful than just mine. Good to see your post retirement strategy taking shape RIT. I agree it makes no sense to take more risk with a higher equities exposure than you need to generate your income requirements and your 55% should be fine long term. 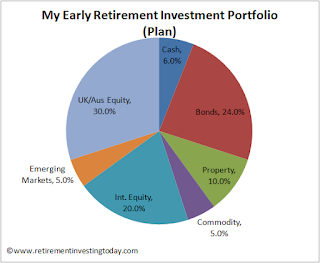 As you know, I have been moving a significant proportion of my portfolio into the Vanguard LifeStrategy 60 (or 40)and I am sure this could form a simple core fund for your strategy. The big advantage would be the auto rebalance feature - once set, it stays set at the precise level of equity you require. It now has 5 years since inception and the average returns compare well against other multi asset funds. Good luck with the planning - I am sure you will enjoy the process! Good to hear from you John and I continue to follow your blog with interest. Despite not owning I'm also a big fan of the Vanguard LifeStrategy funds as well and have written about them in the past. If I was starting again they would be a major part of my portfolio. As it sits today I think I'll be able to transition to the new portfolio by just adding dividends and some new money to existing holdings over the next half year or so. I'd even FIRE with the transition expecting to transition within a year or so as I've learnt perfection is not required. So shouldn't have to sell anything preventing expenses and buy/sell spread losses. If I was planning a life in the sun, LifeStrategy 60 would work for me! Less temptation to tweak, possibly lower costs, greater diversity, less need to manage the funds... bring on the simplicity. Perhaps leave some loose change to one side for a speculative, fun, portfolio. Although that isn't RIT style! Do you spread over multiple brokers, platforms, funds to diversify against risk to institutions? How about an allocation for farmland, in case you do hit 24m euros! "Do you spread over multiple brokers, platforms, funds to diversify against risk to institutions?" It's very important to me and it's one of the reasons I started a Hargreaves Lansdown SIPP incurring some added wrapper expenses when I was already a perfectly happy YouInvest customer. Interesting. Have you tried this allocation in portfoliocharts.com? I have no affiliation to this site by the way; I just think it's a very good tool for analysis, albeit US-centric. Thanks for the link. Just had a quick play with the FI calculator. 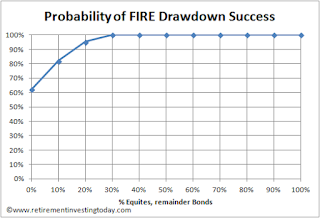 Save 50% (must be net and not my gross) into a 60% Total Stock / 40% Total Bond portfolio targeting a 3.3% withdrawal rate in FIRE and FI could arrive in 13 or so years. Just shows what I've achieved is not special or exclusive. How do you plan to split the investments between pension and ISA wrappers? Do you just split the diversified portfolio evenly across them? I've got a 9 year wait before accessing my pension, and currently have a large FTSE 100 in the SIPP and bitty Europe/Japan/Emerging in the ISAs, but that's historical, I've no particular urge to access one before the other. I look at Pension to non-Pension split (with ISA a part of non-Pension). I have significant non-pension/non-ISA holdings as I've built wealth so quickly and couldn't ISA shelter quickly enough. All of the home purchase cash (not yet complete) and the 3 years of cash are outside the Pension for obvious reasons. My HYP also sits outside as I want the divi's from day 1. After netting the home cash off I'm just trying to make sure my "bonds" to "equity allocations" are similar inside and outside the pension. I will have 11 years to run to private pension age and I just really want to make sure I don't extinguish my non-pension pot before I can access my pension through say a bond or equity collapse. I don't get much more clever than that. When I look at my portfolio I really just treat it as one pot as I'm aware that I can buy/sell/rebalance in one to cover for what is happening in the other. By far the biggest concern with this proposal is the FX exposure. If you were advising a maltese investor, you'd be crazy to suggest transferring all wealth into sterling. Rates often move >20% and not come back. You do not get paid a premium for taking this risk on. The best advise is to hold wealth in the currency in which it will be spent. If your best guess is that averaged across all eventualities, you will spend 75% of your wealth in Euros, you should transfer that sum as soon as possible. I agree that it is not an ideal situation however the last thing I want to do is reconfigure my portfolio as a Euro portfolio (ie 30% European Equities and predominantly European Bonds) only to then have to transfer it all back to Sterling if the move doesn't work out. I will of course transfer the home and 3x spending cash to Euro's early on. "I’m going to assume a 40 year retirement period." I assume that my widow will live to 99. "I do not intend to buy any type of annuity": I gather they're much better value at age 80. 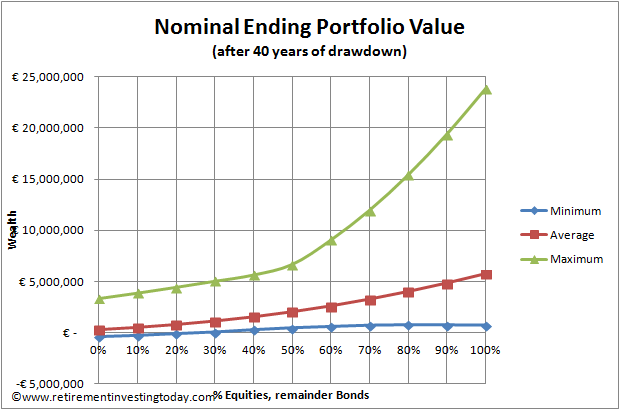 Did you really plan to run a portfolio through your muddled years? I must admit that I haven't yet considered the construct of my portfolio at age 80 nor my possible state of mind at that time. At this point I'm only focused on getting out of my stressful work situation asap which will hopefully give me the best chance possible of making it to 80. I hope you'll keep blogging during your retirement adventure. Best of luck with all this. Plus your income is sterling denominated but your spending is in Euros. This is not advice... but I think you are massively underestimating the potential problems of not having your income in the same currency as your expenditure. Basing your valuations on 1.12 Euros (it dropped to 1.04 during that year?) for the worst year, so far, in a relatively new currency could be a major mistake. If sterling dropped to 0.80 instead of 1.12 your income falls from 24,000 to 17,000. Where you move is a major decision and if you aren't committed, financially as well, I wouldn't do it. At least think about moving to it financially as soon as it looks a good move. Ultimately you believe UK house prices are a basket case and represent no value, this is also what could dramatically reduce the exchange rate. Thanks for jumping in here with some very valid points. "At least think about moving to it financially as soon as it looks a good move." I think this is the key point. At the moment I'm 100% on for the move but want a return route in case it doesn't work out. I think it comes back that I'm always trying to manage risk and run what if scenarios/back up plans. All of the old equity/bond allocation optimization work was done in a normal world. We are now not in a normal world (or perhaps we are and the past 40 years was the non normal period). 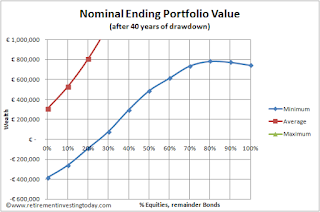 With a majority of the developed world's bond market now in negative yields, they are one of the worlds riskiest asset classes IMHO and they may prove a significant drag on portfolio returns for a significant period. Many congratulations Anon. I wish you much success as you enter the world of FIRE. With a fair wind I won't be far behind you. It's important to note that I'll have 3 years in cash and the portfolio above covers the sum of both pension and non-pension investments. Thank you for sharing! Looks like you are getting close. Good luck! I've been following your blog for three or four years with great interest. I logged on tonight to see what comments had flowed from the trauma of Brexit - none so far!! I realise that for you (as for many of your readers) last night's events will not have been welcome. Any thoughts yet on your plans in the light of the uncertainties that will arise for anyone planning to live on investments in Europe? Hi Frank, please see today's post for some thoughts. I think you have missed a trick here -- your retirement strategy has no tax planning that I can see. Have you seen the tax rates on retirement income in Spain/France/Italy? I do take tax planning very seriously both during the accrual phase that I'm in now but also it is one of a number of considerations for my FIRE location. It just wasn't the focus of this post but has been covered to some extent in previous posts. If I look at the three locations I have left on my shortlist I think with Cyprus my tax rate would be close to 0% (ignoring healthcare costs), Spain would be somewhere near an average of 18% (again ex h'care) of 'earnings' and Malta will be somewhere in between depending on how I played the non-domicile rules. 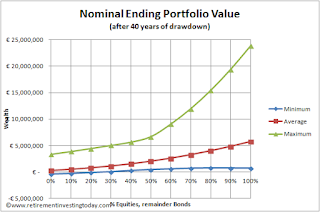 If I put my aims into the table - 40 years, 1% failure rate (essentially 100% success) I end up with an optimal equity to bond ratio of 30% bonds to 70% stocks and a 2.8% withdrawal rate (which is essentially my 2.5% + expenses which is comforting). The equities range for within 0.1% of the maximum withdrawal rate is 18% to 47% which is not so comforting given my choice to hold 65% "equities". Obviously it's US based but it's suggesting I could be carrying way more equities than I really need to. What's interesting though is that with my modelling I wanted a hard 100% success which required somewhere between 60 and 70% equities (60% equities giving me 99% and 70% giving me 100%). 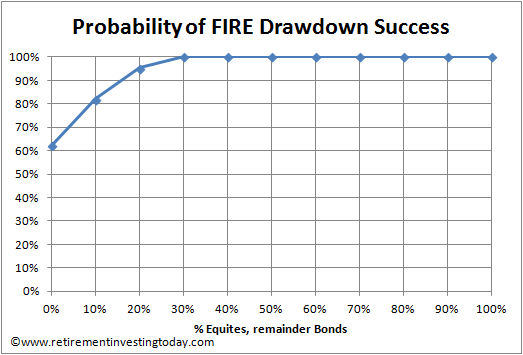 I can't remember if you've mentioned it in the past but have you set yourself a FIRE equity to bonds ratio yet? Is this something you're considering as it seems to go quite a bit against the conventional wisdom. - For a 30 year retirement, a 1% failure rate and a 3.3% (3.4%-0.1%) withdrawal rate you can have anywhere between 17 and 42% equities. - For a 35 year retirement, a 1% failure rate and a 3.0% (3.1%-0.1%) withdrawal rate you can have anywhere between 17 and 46% equities. - For a 40 year retirement, a 1% failure rate and a 2.7% (2.8%-0.1%) withdrawal rate you can have anywhere between 18 and 47% equities. The critical decision is therefore not the equity/bond relationship but picking the withdrawal rate. It's also interesting that the withdrawal rates (which would include expenses I would guess) are all a long way from the oft hyped "4% rule". Me again, forgot to ask why 'predominately corporate bonds'? Even investment-grade corporates tend to be much riskier than high-grade government bonds during turmoil - exposing you to downside volatility just when you could do without it. - Global but predominantly UK Corporate Bonds. Right now the Gilts are about 70% and the Corporate Bonds are 30%. I'd expect that ratio to approximately hold in FIRE for the reasons you mention. Ah good, that ratio of gov : corporate bonds seems safer to me in a retirement portfolio - notwithstanding the currency mismatch others have commented upon. I'm something of a bond purist so intend to hold purely domestic gov bonds to dampen volatility and leave equities to take care of growth. I haven't settled on my retirement equities / bonds ratio yet. I'm erring towards something like 40:60 to begin with to guard against sequence of returns risk. Then allow it to drift up to 50:50 over the course of the first 10 years. Like you, I'm thinking in terms of 40 years but allowing for a 10% failure rate. In reality my failure rate won't be that high as I'd cut expenditure or just burn bonds for years rather than sell equities at rock bottom prices. I wanted you to see the piece because it gives you the option to carry less equities than you might have thought and reduce volatility in the early years. Hopefully reassuring! Most interesting and thanks for sharing your thoughts. Using the Pfau research for your 40 years and 10% failure rate presents the optimum as 58% stocks for a 3.8% WR so you're a little more conservative. Back that off to 3.7% WR and the stocks allocation widens hugely to 39% to 78%. You're certainly within that range. Is that WR, which is again below the 4% Rule, somewhere near what you are planning? As you rightly identify from the piece, the set of reasonable allocations is actually a pretty wide spread. This is corroborated by other work I've read. The truly optimal allocation can't be known in advance so all we can do is pick the ballpark. Any study that shows a precise allocation is dependent on its assumptions. Those assumptions don't hold in reality e.g. I won't recklessly spend from my portfolio so all my money runs out while I've still got years left on the clock. That's why failure rates are something of a misnomer. They help theoreticians reach a conclusion but aren't an accurate reflection of real-world behaviour. There's always an option. If I'm still going strong in my late seventies or eighties I could annuitise relatively cheaply, if I really got into trouble then I'd look at a reverse mortgage (as unpalatable as that seems now). My desired withdrawal rate is 3%. 4% doesn't hold for the UK or even the global portfolio, as I think you've previously written. But there are lots of methodologies out there for dynamic withdrawal rates that flex according to market performance i.e. hiking it if you're ahead of the game and lowering it when you're taking a pasting. Behavioural economics suggests we humans will overpay to eliminate a very small risk - hence the insurance industry. I'd like 100% safety too. 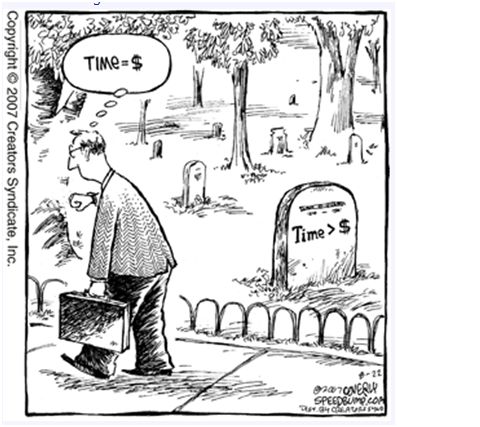 In reality, it's too expensive - I'd have to work way too long - and there are other ways to achieve much the same thing. Yes, I have written about 4% being too high for a UK investor previously. - You're at a WR of 3% and I'm at 2.5% with us both planning a 40 year retirement. - I'm trying to be 100% certain (of course we can never be 100% so let's call it 99%) and you're trying to be 90% (but with 3% + expenses (which I'm sure will be low given your passive beliefs) this research says you're actually closer to 95% or better acknowledging the US bias). - We both also have back-up plans to cut back in down turns. - You're planning on starting at 40% equities and ramping to 50% while I'm possibly a little bullish at 65%. That said the research says we have quite a big tolerance here and I may need to scale back a little. I'm sure over the years we've crunched similar/the same datasets and read many of the same articles but your thoughts do give me some confidence that I'm not far from being the best prepared I can be. Many thanks for jumping in here TA as it's been most worthwhile. - what's particularly interesting is that the 4% is thrown around so flippantly by some pretty big blogs and websites yet both of us have backed away from that by a big amount. Either we're wrong or I hope those that read those sites don't end up seeing a poor historic sequence of returns. Do you have some thoughts here? - on the excellent Monevator you write a lot of the passive type articles but never seem to post about FIRE. I for one would value some posts on this topic as you clearly have plenty of excellent knowledge on the topic and this site is just not big enough to get a critical mass of UK views. Any possibility do you think? The 4% rule seems to have stuck because it's simple to grasp and reasonably achievable but essentially it's been imported from the US without due regard to its underlying assumptions. It's as if someone pulled off the warning sticker at customs. Even in the US there are commentators who warn that it may not hold in the future. But, one of the curiosities of the rule is that it represents a worst case scenario. In other words, the majority of US retirees could have achieved a higher withdrawal rate in most historical periods. So with any luck, anyone who cuts it a bit fine won't fall into a historically benighted period when 4% or even 3% doesn't cut it. If you have a plan for cutting expenditure during a bad sequence of returns, or earning extra income, or avoiding selling equities then you won't even need luck. I've written a few FIRE posts on Monevator but they are few and far between. The FIRE community seems so well served that I've mostly stuck to demystifying investing. I'm working behind the scenes at the mo on the Monevator book so my post rate has collapsed but I am planning to write more about withdrawal strategies when I return to full frontline duties. I must say, I haven't seen anyone who's planned their FIRE moment as diligently as you. It makes me smile to think of the fun you'll have. I hope you keep posting on life in the FIRE-after. I need beacons to guide me in! "I'm jealous ;-)" You're only 5.5 years behind me good sir. If it's been anything like my journey it will fly by. My plan is to keep posting in FIRE as building the wealth is only part of the journey and where most of the global blogging action is. Not that many being very transparent in FIRE though and so I hope I can add some value here. After Brexit net worth on UK investments has been reduced by 20% in dollar terms and possibly more in the future. I cannot see this considered in any calculation.